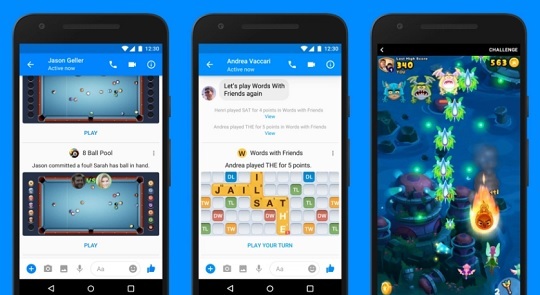 Facebook has started rolling out Instant Games on Messenger worldwide so more users will be able to enjoy its newest rich gameplay features. Previously only available in the US, Instant Games on Messenger will now be available to 1.2 billion users globally. And, everyone will now be able to experience the new features that were exclusively previewed to developers at Facebook's recent F8 conference. The new features include the rich gameplay features, which allow developers to create "unique and sophisticated experiences and game bots" to aid game makers in developing exciting features such as new levels and rewards. Turn-based games (Facebook's most requested feature) can now offer more visually engaging and customizable game messages during play, with game bots helping re-engage players by calling out new game options and giving out updates. Zynga's World With Friends is one of the first games to take advantage of the new rich gameplay features. Facebook says that as the update begins to take effect on Instant Games on Messenger, people will start seeing the new features. Instant Games on Messenger currently has up to 50 game titles available, with more being introduced almost every week. Soon, users will also be able to play Miniclip's famous 8 Ball Pool game. Over the next few weeks, the new Instant Games on Messenger will be rolled out worldwide for both iOS and Android users.